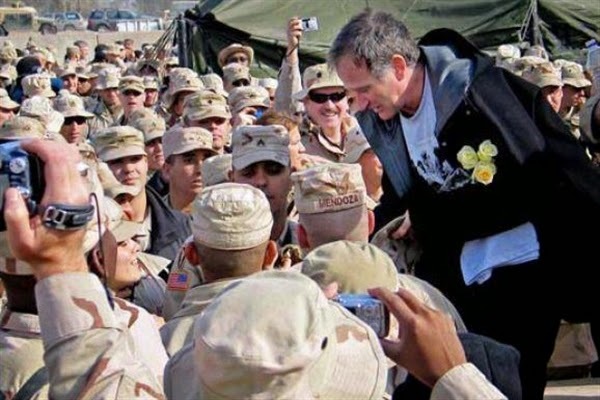 WASHINGTON, Aug. 12, 2014 - U.S. service members truly lost a friend with the death of Robin Williams yesterday. It was my privilege to accompany him on many of those tours, and I can attest that he truly loved doing what he was doing and the people he was doing it for. There really was no difference between Robin on stage and Robin behind the scenes. On the first trip with Air Force Gen. Richard B. Myers, then-chairman of the Joint Chefs of Staff, the plane stopped at Shannon Airport, Ireland, to refuel. He got off the plane into the midst of about 150 National Guardsmen going home. Robin shook every hand, posed for every picture and ensured the Guardsmen knew he appreciated their sacrifices. At the end of every performance -- be it a combat outpost or a forward operating base -- Robin was always the last entertainer to leave. In Iraq, a group of Marines came in from patrol and missed his show. He made it a point to meet with them and give them 20-minutes of fun, even as the chopper's blades were turning to go to the next show. In Afghanistan, the "clamshell" at Bagram Air Field was a favorite venue for him, and he performed there many times. In 2010, he started the show with "I love what you've done with the place." He was not a prima donna. One time a sandstorm grounded the party at an outpost near Baghdad. Robin along with everyone else crammed into a small "tin can" to spend the night. The next day his jokes about snoring and gaseous emissions pretty much convulsed everyone. There was a serious side. He knew what was happening in the areas he traveled. He understood what the men and women he was entertaining did for America each day. He discussed events in the region with knowledge, but used humor -- even then -- to make his point. Once aboard a C-17, he described the dangers of the terrorist safe havens in Pakistan to New York Times correspondent Thom Shanker and in a way that can't be repeated here, but was right on the money. He also visited enough wounded service members in clinics and hospitals to understand the cost. One show in 2007 sticks in my mind. He was in the middle of a performance at Camp Arifjan in Kuwait when "To the Colors" and "Retreat" sounded. As one, the audience stood up and turned around to render honors as the flag came down. Robin had no idea what was happening. Members of the audience told him what was happening once it was over. I asked him after the show what he thought. "Sort of reminds you why we're here, doesn't it," he said.